The Uranco uranium enrichment plant is nearby. It supplies much of the fuel for U.S. power reactors. Just down the road is the troubled Waste Issolation Pilot Project, WIPP. Touted to contain radioactive waste safely for a thousand years, it suffered a fire and explosion after only 15 years of operation, releasing plutonium and other deadly radioactive materials into the environment, and contaminating at least 22 workers. 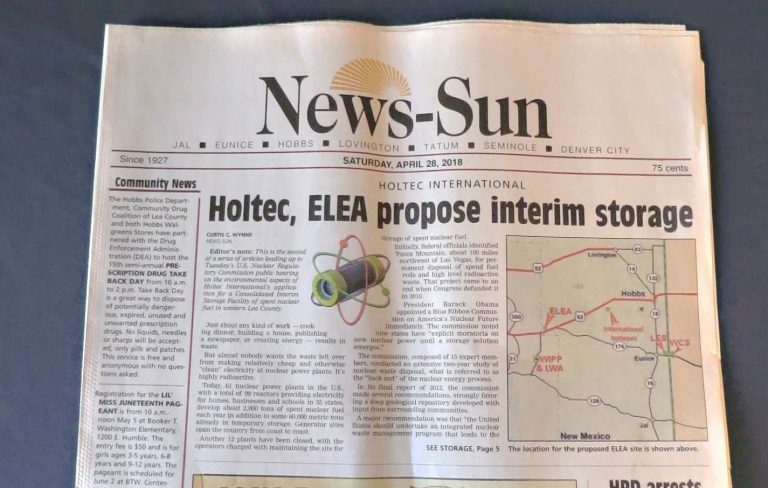 Proponents of the Holtec/Eddy-Lea dump project tout it as an economic boon for the region. Opponents see as it a public health and environmental disaster. The Nuclear Regulatory Commission (NRC) scheduled five meeting around New Mexico to record public opinion on the issues. The EON team traveled there to cover those meetings as part of our forthcoming documentary series segments SHUTDOWN – The Case of San Onofre. If the dump is opened, it could become the destination of the waste currently being buried on the beach at San Onofre. We wanted to see if, as the Holtec dump proponents claim, there is strong local support for the project. And we wanted to express our solidarity with those in opposition. We found that, in fact, all around the state, public opinion runs 5-1 against the project. Below are a series of excerpts from some of the NRC meetings we covered. The opinions expressed are representative of majority sentiments around the state.